I needed a fun way to give my nephew money for his birthday, and luckily I came across this post by Jennifer McGuire, where she had a dog holding the money rolled up. 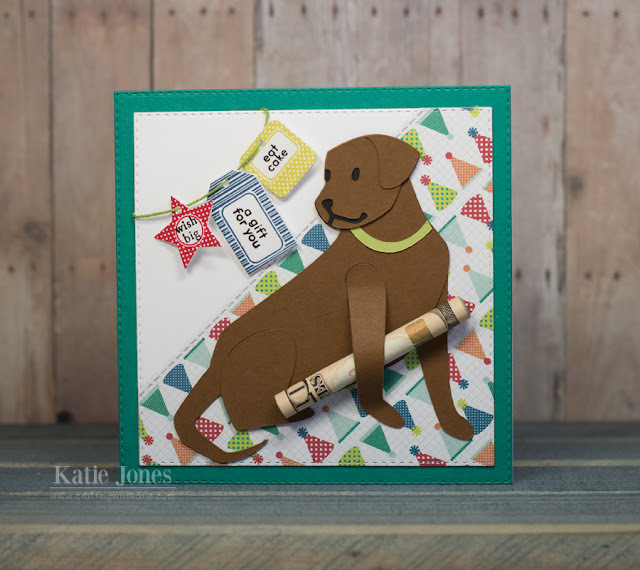 She used a dog stamp, but I found a fun dog in the Cricut Pet Shop cartridge. I just adhered the front leg at the top, tucked the money under it, and then adhered the paw to the card. My nephew will be able to easily slide out the money. For the base of the card, I used the My Creative Time Stitched Squares Inside & Out, and I also used one of the MCT More Stitched Edges dies to give the diagonal cut. I created the little banner using Papertrey Ink's Tiny Tags Die and Stamp Set, along with the Tiny Tags II Stamp Set. OMG!! Too cute for words! I love your idea!! Pet Shp is one of my favorite cartridges. I love how you tucked in the money.